Fast family-friendly weeknight meals like this simple One Pan Roasted Squash, Apple and Sausage Dinner are so helpful to have on hand! The weekends this September have been busy too, and equally as productive. Jase is building us a real sugar house for maple season next spring. Woohoo. This backyard sugaring operation is about to go legit! The sugar house, is coming right along and it’s a lot bigger than I thought it was going to be. But I guess I shouldn’t be surprised since Jase is obsessed with out buildings and sugaring, so I should have known it would be more than a shack! Last weekend, I went to Blog Brulee at Smugglers’ Notch to speak about food photography. It was my second year with the honor of being invited to talk about food photography for food bloggers, and I had a wonderful time. And I learned a lot too. 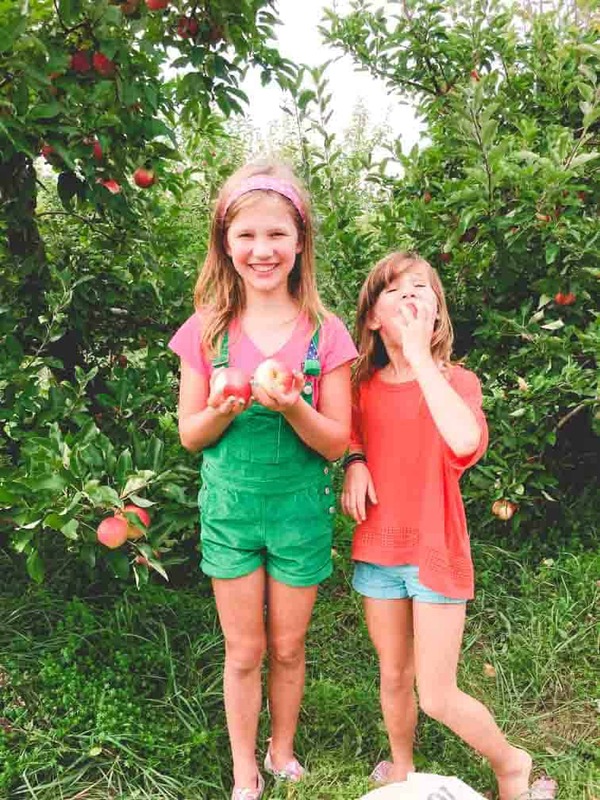 My girls and I went also went apple picking at my favorite local orchard. We picked McIntosh and Galas. The Honey Crisp were only available pre-picked in the farm store, and I paid a premium for a bag of those as well. They are totally and completely worth it! I have been baking and cooking with the apples since we brought them all home. Luckily, I have a second fridge in the basement, so I haven’t been worried about them going bad. I hope they last until Thanksgiving. If we don’t eat them all first! I used some of the apples in this one-pan sausage dinner recipe today, and I have at least two more recipes coming soon with apples so be on the lookout for those in the next couple of weeks. So, speaking of this one-pan dinner recipe… um, you guys. Trust me, you are going to LOVE the taste of this sausage dinner! The flavor is so good. 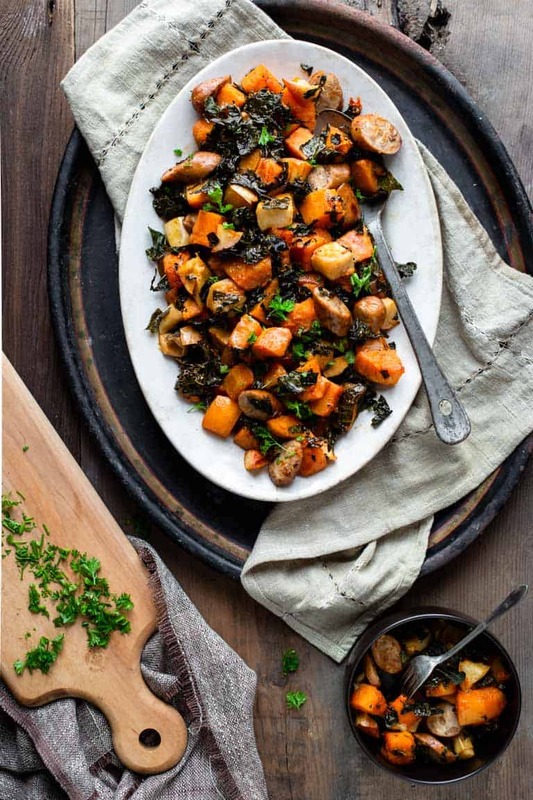 The butternut squash gets roasted for a little bit, because it takes longer than everything else, then I added in kale from our garden, our fresh picked local apples and sliced organic Applegate Organic Chicken Apple Sausage. I’m also in love with the whole one-pan dinner concept! They’re so easy to make and clean up! So check out this Lemon Butter Chicken from Veggie Balance. It’s another awesome one-pan dinner featuring chicken. I have to confess, I sent an earlier draft of it to Sarah, who helps me with cross-testing, and she sent the test report back requesting more flavor. You don’t have to tell a flavor hound like me to up the flavor more than once! I added smoked paprika, nutmeg and Dijon mustard. Plus it has sherry vinegar and dark maple syrup. I am so glad she did say something, because though I liked it pretty well when I sent it to her the first time, after I added some oomph, now it is simply delicious! Like everybody-had-seconds-good! This one-pan dinner recipe comes together in about 45 minutes and requires very little hands on prep work. To make this sausage dinner, simply de-seed and cut up a butternut squash and slice a few links of chicken apple sausage. Then shred the kale and peel and chop the apples. Once that’s done, toss the squash in a little olive oil and spices and roast for 10 minutes. Then, add the rest of the produce and sausage to the baking tray and roast for another 20 minutes or so, until the apples and squash have softened. Take the tray out of the oven and immediately toss everything with a mixture of sherry vinegar, mustard, and maple syrup. This sausage dinner is best enjoyed right away, but leftovers will keep in the fridge for a few days. Fall means busier schedules, so this one pan roasted squash, apple and sausage dinner is a perfect fast family-friendly weeknight meal! Preheat oven to 425ºF. Shake vinegar, maple syrup and mustard in a small jar. Meanwhile, toss squash, oil, smoked paprika, salt, nutmeg and pepper in a large bowl to coat. Spread out on a large rimmed baking sheet. Transfer squash to the oven and roast 10 minutes. Add apples, sausage and kale and toss to coat. Return to the oven and roast, stirring once or twice until the apples are softened and the squash is tender, about 18 to 22 minutes longer. Remove from the oven. Drizzle the vinegar mixture over the roasted mixture and toss to coat. Serve immediately. This looks so good, apples go so well with sausage! Hi Marye, Thank you! Happy fall to you. Your sweet girls–so precious!! We have a trip planned to the orchard this weekend. 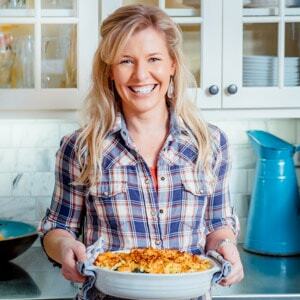 I can’t wait to have some apples and will be making this easy meal for sure! Thank you so much. They melt me. (Most of the time, ha ha.) Have a great time apple picking. I love the tradition every year. Squash and sausage are literally two of my favorites! AMAZING dish! I am totally with you Maria! Yum! Such nice flavors for fall! Thanks so much Diane. I get a little squash obsessed every fall. Ha ha. There is total satisfaction in using fruit (or any ingredient) that you picked or grew. I think it’s great for the girls to be aware of that too. This sounds like such a great fall meal and a great use of all those apples! We really loved the final version of this recipe. The flavors are so good together. I will be making it again for sure. We have a ton of apples to get through, lol. Oh my goodness, this sounds heavenly!!! I’ve been ALL about the apples this season as well, and this looks like a perfect fall dinner! And so easy! I can’t get enough of them! Ha ha! There appears to be a typo at the maple syrup ingredient. How much? Thank you for pointing that out Marylyn. It is 1 tablespoon. I made the change on the recipe above and updated it as well. Have a wonderful day. Does the kale need to be in the oven for that long? I am concerned about it getting burnt. I tested it twice and my cross-tester tested it twice. Neither of us had a problem with burnt kale. The sheet pan is quite full which insulates it a bit. That said, if you’re worried about it you could try adding it in a bit later. Please let me know if you try it. Happy cooking Lauren. Hi, Katie! Love your blog and your recipes! Made this over the weekend. We tossed it with penne (I know – added carbs – but everyone loved it!). Still enjoying the leftovers – thanks for the recipe! Betsy, thank you so much for coming back and letting me know. That means so much! And for the record I love the idea of adding pasta to this to extend it a bit. Our family devoured the whole pan and I know left-overs would have been appreciated! Ha ha! Hope you have a great week. Can you substitute spinach for the kale? I have every thin in house except the kale. Yes, but because it is more tender than kale I would say do not roast it. Just add it in in step 4 and allow the heat of the hot roasted veggies to wilt it. Any options for the sherry vinegar? Red wine vinegar or apple cider vinegar are good substitutes for the sherry vinegar. Hope you enjoy it! I made this tonight and it’s really tasty! I plan to eat this as a snack in the afternoon!! Great recipe! i’m sharing this one with my mom! Let look this dish’s colour, so amazing! Should the apple be peeled as well? You can peel the apple, but it is a little healthier to leave it on. If you don’t mind the texture- it’s totally fine to leave it on. Delicious! The sausage gave such marvelous flavor to this easy dinner! This is my kind of one pan dinner! So perfect for a busy weeknight when you need something easy to make! 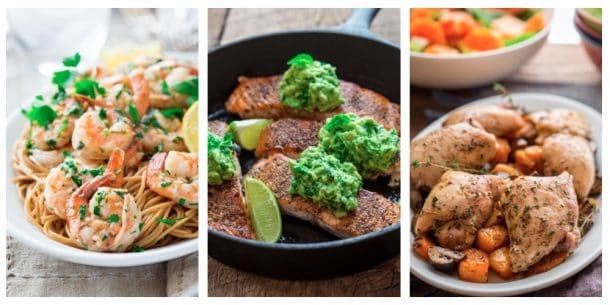 Love an easy one pan meal that is total comfort food! The warming flavors are just perfect for this season. Loved this the first time I made it!! 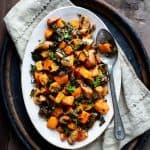 Can the recipe be modified ito use frozen butternut squash instead of fresh?